For some of us, we celebrate Fat Tuesday. It is the last day before Lent to indulge. Since Fat Tuesday is a huge celebration in New Orleans, why not bring a New Orleans classic sandwich to your home today. Try a Muffaletta! 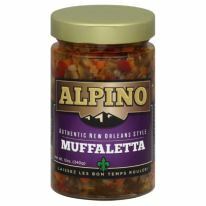 Puckered Pickle offers Alpino’s Authentic New Orleans Style Muffaletta, which is perfect for your Fat Tuesday celebration. Check out this recipe from Puckered Pickle. Traditionally made with a 7” round loaf of bread, I prefer Ciabatta. Slice bread in half across. Take some of the inside of the top half out. Cut the sandwich into wedges and serve! Mmmm! I love muffaletta. Great suggestion! I'm celebrating Fat Tuesday today with Jambalaya and King Cake. Have never heard of this Puckered Pickle's before. Sounds tasty! My boys would love this, they can't wait for some King Cake! I have never had this, my hubby would love this!! Sounds good! Interesting, very different. My husband would like this, don't think it is for me. I love Muffaletta! I don't usually make it, as it always seems like a lot of work. This would probably solve a lot of those issues. This is something my husband would enjoy. He likes pickles and even puts pickle juice on his sandwiches.